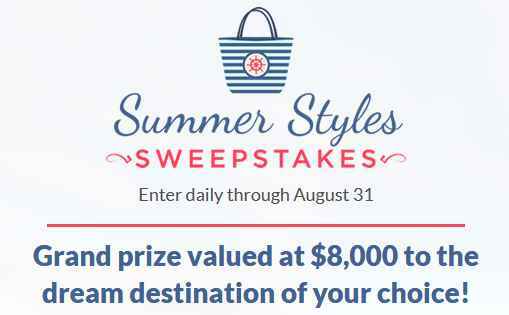 If you like to go the vacation then you must enter JTV Summer Styles Sweepstakes now. By participating in this sweepstakes you could win an amazing trip to your dream destination of your choice valued at $8,000. During the sweepstakes go to the sweepstakes page at www.jtv.com/summer. Enter this sweepstakes daily through August 31 for a your chance to win a trip of your choice. Limit one (1) entry per person per each day of the Entry Period. When To Enter: The JTV Summer Styles Sweepstakes begins on or about 12:01 AM Eastern Time on May 21, 2018 and all entries must be received by the Sponsor on or before 11:59 PM Eastern Time on August 31, 2018. Sponsor: America’s Collectibles Network, Inc., d/b/a Jewelry Television. Sweepstakes Prize: Win A tropical 6-night getaway for two to an all-inclusive resort in St. Lucia, Punta Cana or Cabo San Lucas. Round-trip airfare for two $1000 Cash plus $1000 in JTV Gift Cards.